Solid meshes contain SolidFiniteElements which contain SolidNodes. This class simply overloads the appropriate access functions from the underlying Mesh class. Definition at line 2252 of file mesh.h. Definition at line 2258 of file mesh.h. Definition at line 2261 of file mesh.h. Definition at line 2276 of file mesh.h. References oomph::Mesh::Comm_pt, i, and oomph::Mesh::merge_meshes(). Return n-th SolidNodes on b-th boundary. Definition at line 2313 of file mesh.h. Referenced by oomph::ElasticRectangularQuadMesh< ELEMENT >::set_boundary_coordinates(). Return the n-th local SolidNode in elemnet e. This is required to cast the nodes in a solid mesh to be SolidNodes and therefore allow access to the extra SolidNode data. Definition at line 2335 of file mesh.h. References e, oomph::Mesh::Element_pt, oomph::FiniteElement::node_pt(), and node_pt(). Return a pointer to the n-th global SolidNode. Definition at line 2294 of file mesh.h. Referenced by oomph::NonLinearElasticitySmoothMesh< ELEMENT >::actions_before_newton_solve(), oomph::NonLinearElasticitySmoothMesh< ELEMENT >::backup(), oomph::FSI_functions::doc_fsi(), oomph::ElasticRectangularQuadMesh< ELEMENT >::ElasticRectangularQuadMesh(), element_node_pt(), oomph::NonLinearElasticitySmoothMesh< ELEMENT >::operator()(), oomph::LinearElasticitySmoothMesh< LINEAR_ELASTICITY_ELEMENT >::operator()(), oomph::PoissonSmoothMesh< POISSON_ELEMENT >::operator()(), and oomph::NonLinearElasticitySmoothMesh< ELEMENT >::reset(). Definition at line 2267 of file mesh.h. Scale all nodal coordinates by given factor and re-assign the Lagrangian coordinates. Definition at line 2374 of file mesh.h. Make the current configuration the undeformed one by setting the nodal Lagrangian coordinates to their current Eulerian ones. Definition at line 9196 of file mesh.cc. References oomph::SolidNode::nlagrangian(), oomph::SolidNode::nlagrangian_type(), oomph::Mesh::nnode(), oomph::Mesh::Node_pt, oomph::Node::x_gen(), and oomph::SolidNode::xi_gen(). 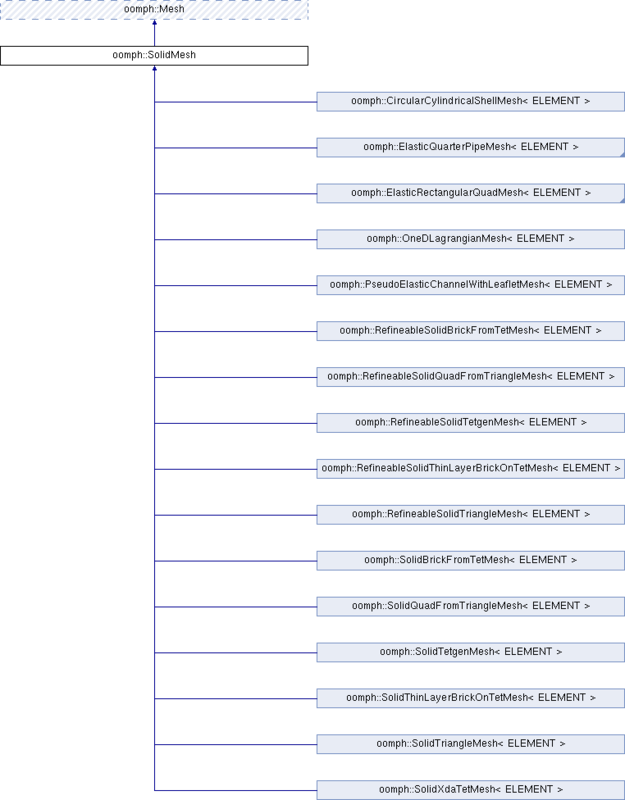 Referenced by oomph::ElasticQuarterPipeMesh< ELEMENT >::ElasticQuarterPipeMesh(), oomph::ElasticRectangularQuadMesh< ELEMENT >::ElasticRectangularQuadMesh(), oomph::OneDLagrangianMesh< ELEMENT >::OneDLagrangianMesh(), oomph::NonLinearElasticitySmoothMesh< ELEMENT >::operator()(), oomph::LinearElasticitySmoothMesh< LINEAR_ELASTICITY_ELEMENT >::operator()(), oomph::PoissonSmoothMesh< POISSON_ELEMENT >::operator()(), oomph::PseudoElasticChannelWithLeafletMesh< ELEMENT >::PseudoElasticChannelWithLeafletMesh(), oomph::RefineableSolidBrickFromTetMesh< ELEMENT >::RefineableSolidBrickFromTetMesh(), oomph::RefineableSolidThinLayerBrickOnTetMesh< ELEMENT >::RefineableSolidThinLayerBrickOnTetMesh(), oomph::RefineableSolidTriangleMesh< ELEMENT >::RefineableSolidTriangleMesh(), scale_mesh(), oomph::SolidBrickFromTetMesh< ELEMENT >::SolidBrickFromTetMesh(), oomph::SolidTetMesh< ELEMENT >::SolidTetMesh(), oomph::SolidThinLayerBrickOnTetMesh< ELEMENT >::SolidThinLayerBrickOnTetMesh(), oomph::SolidTriangleMesh< ELEMENT >::SolidTriangleMesh(), and oomph::SolidXdaTetMesh< ELEMENT >::SolidXdaTetMesh(). Static problem that can be used to assign initial conditions on a given mesh. Definition at line 2384 of file mesh.h.